Welcome to the first post of the inaugural website launch! I’m very thrilled about finally having Photography by Delvene go ‘live’ and would like to take this opportunity to thank my wonderful friends at WordPress Agency. They’ve been ever so patient and accommodating toward my vision for this site. Special thanks also goes out to a great mate of mine Jonno Sea, who took some time out to take some pics of me for this site. Ahead is a relatively busy month for me with a 1st birthday event coming up, a number of family portraits and a special engagement session involving their 4-legged best friends. If you would like to book something in before Summer and the silly season starts, please enquire on my Contact page. Now to get down to business! 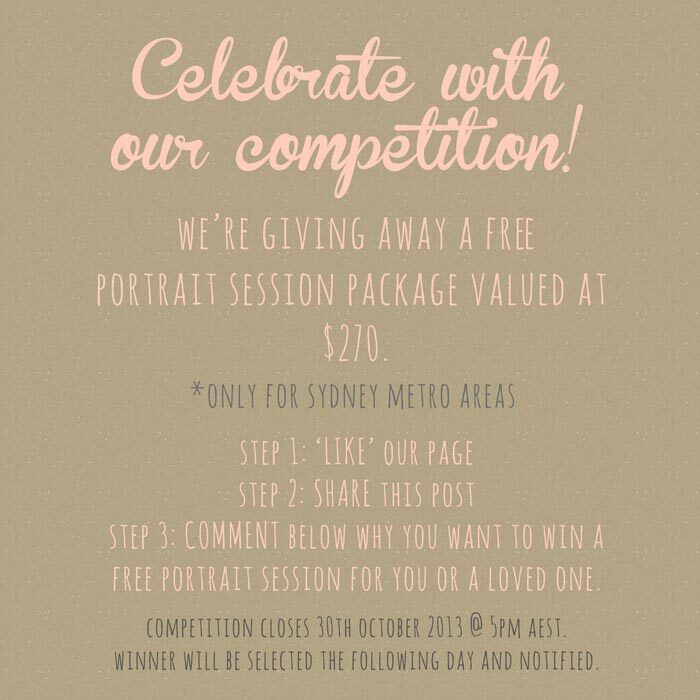 With the launch of this site, I’d like to celebrate by giving away a free portrait session package for a special individual, couple, baby or family, and just in time for Christmas! 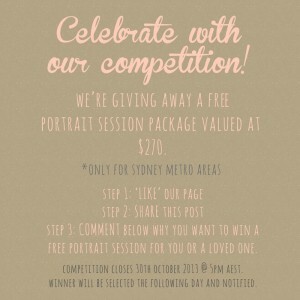 The package includes your photo session within metropolitan Sydney, two mounted 5×7 inch prints and a framed 8×12 inch print, all valued at $270. To enter, please visit our Facebook page Photography by Delvene, go to our competition post (shown below), like our page, share the post and comment why you or a special person in your life would like to win a free portrait session. The competition closes on 30th October 2013 at 5:00pm AEST. The winner will be selected by the following day and notified through Facebook and email. Please ensure when you share the post that it is set to ‘Public’, otherwise I won’t be able to view the share. Thank you and all the best!